We all knew it. No one wanted to say anything. Finally someone did and then it was a Who concert stampede of agreement. Shorty was, in his secret life, Lance Bass. How a Dayton native could grow to receive so much fame was beyond our reasoning, but yet he did. He kept the media circus to a minimum and some how was able to tour and hold down a design job while spending 12 hours a day at DeFabCo while painting Gaelic designs on refrigerators. Of course, there were rumors. Questions. Elle magazine subscriptions. We all, once again, began to wonder how the fame would go to his loins. Shorty would spend a lot of time at choir practices and The Columbus Men's Origami functions. We knew the news would break... we just didn't know how big it would break. 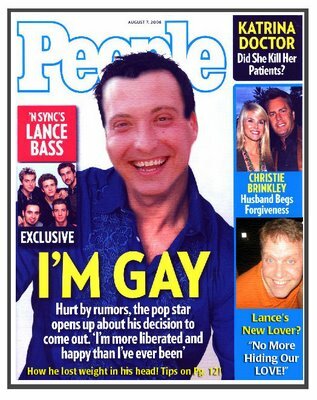 PEOPLE magazine came out with the story. We still love you Lance/Shorty. Just now it the other 50% of us that are more frightened.